Despite its size and various eras of occupation, Malta sustained a vibrant silver and gold-working tradition across several centuries. An estimated 600 silversmiths worked on the island from 1680-1820 catering to the wealth of the Knights of St John and resident foreign dignitaries. However, Maltese silver is rare, particularly on the island itself where so much was melted down on the orders of Napoleon or left its homeland as mementos of a tour of duty. 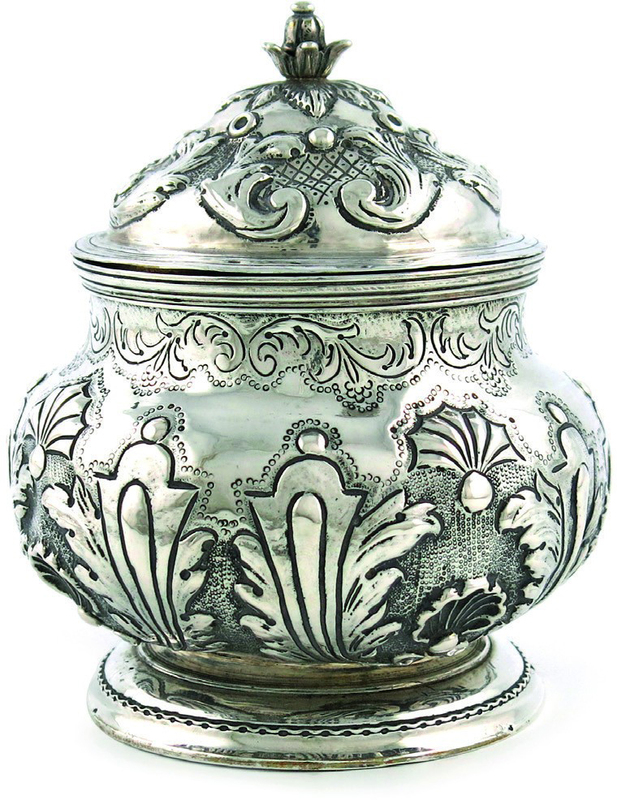 All this explains the multi-estimate response to a Maltese sugar bowl and cover offered at the Woolley & Wallis (25% buyer’s premium) Fine Silver sale in Salisbury on October 30. Maltese silver is typically catalogued according to the name of the presiding Grand Master of the Order of St John, with this vessel c.1730 from the time of António Manoel de Vilhena (1722-36). Also selling well was a rare early 19th century Maltese wine label: a crescent form incised Sherry and marked for Gioacchino Lebrun, c.1805. Estimated at £150-200, perhaps three times the value of an English equivalent, it sold at £600. The sale was also notable for more early spoons from the collection of David Constable, author of the two-volume Silver Spoons of Britain, 1200- 1710 (2016) and The Benson Collection of Early Silver Spoons (2012). Copies of both books were included as a lot in the sale and took £380. Two London-made spoons from the reign of Henry VIII took £9000 each – providing contrasting commercial fortunes. One one hand, a St Paul apostle spoon with an unascribed maker’s mark for 1535 and the prick-dot initials O over IM had last sold at Bonhams on July 2007 for £8000. On the other, a fine spoon by William Simpson, London 1530, with traces of gilding to the lion sejant affronté finial, also came with a long auction history, including sales as part of the Quernmore collection at Bonhams in 2008 and the Roger Whittaker collection at Sotheby’s in 1999. It had sold then at £16,000 and £18,000 respectively. This tranche of the Constable collection also marked the return to auction of the Barncleuch spoon – a Charles I Puritan spoon by George Gleghorne (Edinburgh, 1653-5), initialled for Quintin Hamilton of Barncleuch, and his wife Marion Denham. It took a mighty £27,000 at Lyon & Turnbull in 2010 (when it made the ATG front cover) but was passed this time at £20,000-30,000. One can only conclude the market has changed, but not everything is in the red. Sold for £4600 (estimate £1000- 1500) was a Charles II West Country silver lace-back trefid spoon made by Ellen Dare, Taunton, initialled IS and TB with the sale 1683. The pair to this spoon (also part of the David Patterson collection sold by Christie’s South Kensington in 1998) was sold in these rooms in April last year for £2700. Collections in disciplines as diverse as Mordan pencils, pin cushions, caddy spoons, wine labels and Georgian silver spurs followed. A George II molinet – a stirring rod normally for hot chocolate – sold at the lower end of a £5000-7000 guide. Measuring 13in (33cm) with a turned wooden handle, it had marks for John Hugh Le Sage, London 1739. They are rare survivors, although a similar George I piece, by Anthony Nelme, London 1719, came up at Denham’s of Horsham earlier this year and sold at £4600. 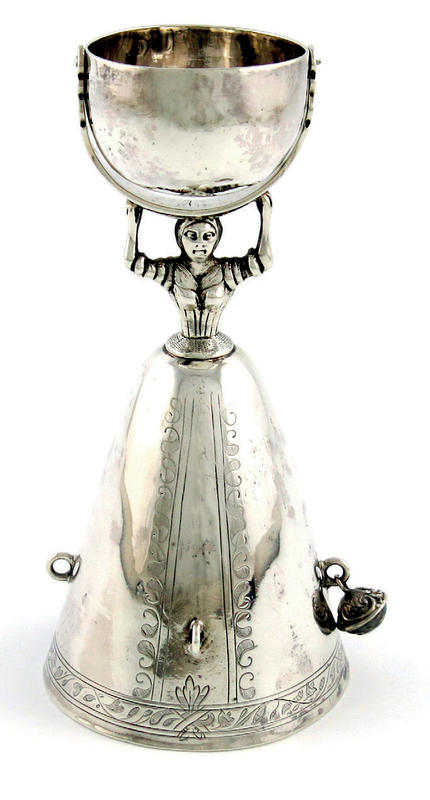 Admirers of the work of Hester Bateman (who successfully ran her family business for 30 years following the death of her husband in 1760) locked horns to acquire a rare 6in (15cm) wager cup modelled in the Germanic style as a lady with her arms aloft holding a hinged circular cup. With marks for Hester Bateman, London 1784, it was also inscribed Wiveliscombe Club 1796, a reference to the small town in Somerset. Minus two missing hanging bells, it sold at £2900 (estimate £600-800). Another example (also 1784) sold for $5000 at Christie’s New York in 2013. 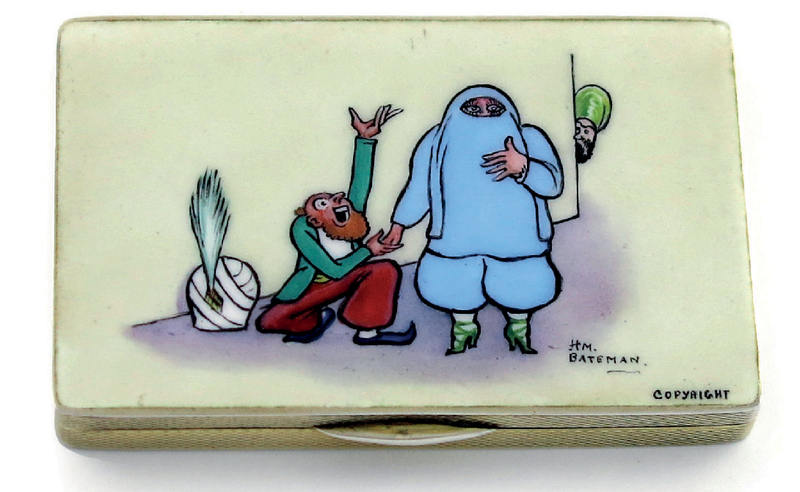 Continental cigarette box with enamelled Bateman cartoon – £950. A very different Bateman – the cartoonist Henry Mayo Bateman – was represented by a Continental cigarette box bearing the import marks for London 1930. An enamelled cartoon to the cover depicted a man dressed in a burka. Signed H.M. Bateman, Copyright, the box prompted a £950 bid. 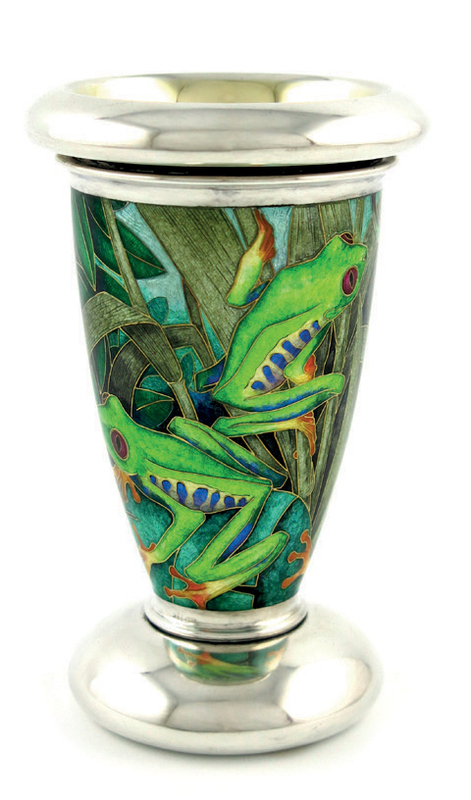 The top lot in the sale was a piece of contemporary silver: a 6in (16cm) high vase decorated with frogs among reeds displaying the considerable enamelling skills of Fred Rich (b.1954). Similar to examples of his work in the Goldsmiths Company collection, it carried hallmarks for London 1994 and was also signed Fred Rich 94. Estimated at £5000-7000, it sold at £11,000. Rich’s whacky three-piece ‘Millennium Tea Dance’ teaset made in partnership with silversmith Adrian Butcher failed to reach £20,000-30,000 (something close to its retail price in 2000), but it found a buyer after the sale at £13,000.